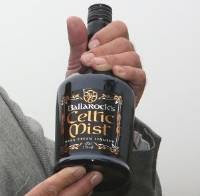 Ballarock’s Celtic mist will appear on Manx supermarket shelves this week. The drink is made from 100 per cent Manx dairy cream and the company says it reflects the ‘unique Celtic/Norse cultural heritage of the Isle of Man’. Ballarock’s Celtic Mist is the first of what is hoped to be a number of products produced by Ballarock Ltd. The sales pitch for Celtic Mist says it evokes the legend of Manannan mac Lir, the mythical god-king and protector of the Island who is said to have lived on South Barrule, the next hill but one to Ballarock. It is made from cream and selected fine grain spirits, with subtle hints of caramel and butterscotch and comes in full-size 70cl bottles. The label was designed by Manx graphic designer Tracey Harding, in the Celtic revival style originally championed by Archibald Knox.